On a day when the Council on American-Islamic Relations (CAIR) issued a report accusing its critics of bigotry, a Justice Department investigation reminds the public why CAIR does not merit the public's trust. Inspector General Michael Horowitz found a series of incidents in which FBI field offices knowingly engaged in outreach activity with CAIR despite a 2008 policy banning non-investigative cooperation with the Islamist group. Only a summary of the report has been released publicly. The rest is considered classified, but has been made available to Congress. The ban on interactions with CAIR, first reported by the Investigative Project on Terrorism, resulted from an FBI investigation into a Muslim Brotherhood-created Hamas-support network in the United States. Internal documents seized by the FBI show that CAIR and its founders, Omar Ahmad and Nihad Awad, were a part of that network known as the Palestine Committee. Both men appear on a telephone list of Palestine Committee members (Ahmad is listed under a pseudonym "Omar Yehya), and CAIR is listed on a meeting agenda listing the committee's branches. 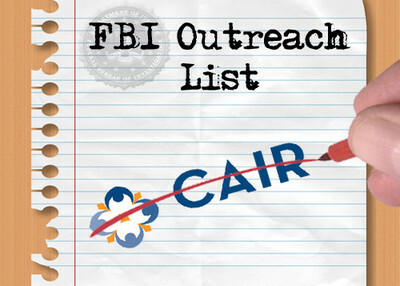 "[U] ntil we can resolve whether there continues to be a connection between CAIR or its executives and HAMAS," an FBI official wrote in 2009, "the FBI does not view CAIR as an appropriate liaison partner." But several FBI field office agents-in-charge balked at the policy, the Inspector General's report finds, and the FBI's Office of Public Affairs repeatedly offered field offices conflicting information. Despite a series of electronic communications explaining the CAIR ban – it does not apply to criminal investigations or civil rights complaints – issued from August-December 2008, and despite a mandatory meeting for Special Agents in Charge (SAC) of field offices, the head of the Los Angeles FBI office told his agents to ignore FBI headquarters. "[W]e will decide how our relationship is operated and maintained with CAIR barring some additional instruction from FBI Headquarters," the Los Angeles SAC wrote. "Please instruct your folks at this time that are not to abide by the … [policy] but that their direction in regards to CAIR will come from the LA Field Office front office." In a scathing letter to new FBI Director James Comey, U.S. Rep. Frank Wolf, R-Va., called the violations "intolerable" and demanded punishment for those responsible, including "separation from the FBI." Wolf is chairman of the House Appropriations Committee's subcommittee responsible for the FBI's budget. He noted that the investigation only focused on incidents involving three field offices – Chicago, Philadelphia and New Haven, Conn., so the depth of the problem still is not known. The Los Angeles SAC, Wolf added, exhibited "unacceptable and insubordinate behavior from a senior leader of the FBI." "Despite repeated efforts to communicate the policy to the field," Wolf wrote, "this was undermined by conflicting guidance being inexplicably offered by the bureau's Office of Public Affairs as well as outright violations from several field offices." That's what happened in New Haven, the report finds. As the IPT reported in 2011, officials in the field office helped organize a community outreach program knowing that two local CAIR officials were involved. Rather than hold to the FBI policy, they agreed to conceal their role in organizing the event. In addition, the Inspector General found, the Office of Public Affairs advised the field office that the interaction was okay. In 2010, Attorney General Eric Holder was asked whether there was any "new evidence that exonerates CAIR from the allegations that it provides financial support to designated terrorist organizations." "No," said a written reply from Holder. Then-FBI Director Robert Mueller publicly reaffirmed the policy in two separate appearances before Congress a year later, saying "We have no formal relationship with CAIR." "There should have been no confusion about this policy," Wolf wrote, "given the bureau guidance, Congressional direction and media coverage surrounding this directive." Horowitz seemed to agree. He faults the FBI for failing to provide "effective oversight to ensure compliance with the policy." In addition to avoiding interaction with a bad actor, the ban on CAIR contact is meant to prevent the group from touting its connections with law enforcement as a way to enhance its image. That's exactly what happened in Philadelphia in 2010, the Inspector General's report found. A local CAIR official was invited to an FBI "Citizen's Academy" program despite the FBI policy's specific reference to the program as off-limits to CAIR representatives. "A few days later," the report said, "CAIR-Philadelphia posted an article on its website describing its participation in the training program, with a link to the FBI's website." While it boasted about FBI contact in this case, CAIR officials more often disseminate a message of fear to Muslim Americans, portraying FBI agents as ruthless and corrupt – willing to do anything to set up innocent Muslims. One CAIR chapter urged Muslims to "Build a Wall of Resistance" from the FBI and not cooperate in criminal investigations. The policy did not come out of the blue. Awad, picked up on FBI recordings of Palestine Committee meetings, remains CAIR's executive director. He has never acknowledged his relationship with the Hamas-support network, and therefore, never disavowed it. In a 2003 deposition, he claimed not to remember whether he attended a weekend-long Palestine Committee meeting in Philadelphia called to discuss ways to "derail" American peacemaking efforts between Israel and the Palestinians. The group also talked at length about how to deceive Americans by hiding their Hamas support. Those are among the things that make the FBI question "whether there continues to be a connection between CAIR or its executives and HAMAS" and bar interaction between its agents and the group. Perhaps the Inspector General's report will prompt field office officials to stop ignoring their own leaders and the information gathered by their fellow agents. It totally amazes me that this is going on, I am not going to put another democrat in office for another 4 years. if watching and monitoring muslims and there groups is going to save us. so be it, but lets be clear , if you have muslims that want to go radical because of what a contender says, there loyalty is not well placed in this usa, it's a mess,obama is not solving our problems. Mark my words there is over 100 million Americans that own guns and they will not vote to give them up with radical jihads muslims in America, Cair is not teaching what how to be at peace with the west, but to change us, this is and will allways be a Christian nation, Obama can not change our Christian nation by words. continue praying for peace in the east and Jesus will open the eyes of the lost before He returns. beware America islamofascism is exactly what happened in Europe in the Forties: a fith column planned by Hitler. In the name your 1st Amendment terrorism has the capacity to manipulate and lie to medias, minds and governments ; islamofasicme is like a metastased cancer, you don't know you have it until one day it is TOO LATE ! The FBI needs to investigate ALL connections with anything to do with CAIR AND the Muslim Brotherhood! Members need to be rooted out, removed from office, any public office, they need to be arrested, deported, jailed, whatever, but remove them from our midst! CAIR was instrumental in purging the FBI training manual from specific association of Islam with any terrorist activities, just as they oversaw the purging of the official report on the Fort Hood shooting by jihadist Nidal Hassan. I heard of at least one regional FBI director who, when confronted by a former terrorism adviser to the Pentagon, would not dispute that field agents would be ignored when bringing intel on anything Islamic. That particular adviser, along with others who would not "dance", were dismissed by the Obama administration. I would say CAIR has been very effective and instrumental in placing MB associates in key positions of political and bureaucratic import. If it gets through the CAIR filter, there isn't enough substance to investigate.